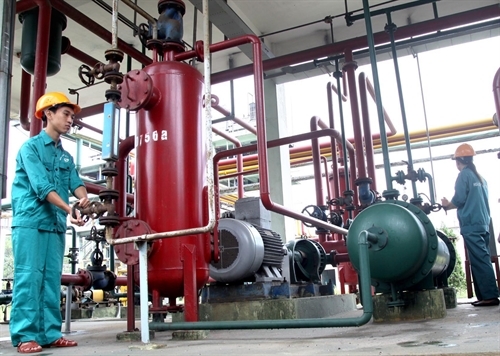 HÀ NỘI — Employees of State-owned enterprises’ subsidiaries will be able to buy shares of the parent companies at preferential prices when those State-owned enterprises (SOEs) are equitised. This is part of the draft decree, developed by the Ministry of Finance to replace Decree 59/2011/NĐ-CP, issued by the Government in July 2011 on transforming an enterprise entirely owned by the State to a joint stock company. The new regulation aims to bring more benefits to the employees in the subsidiaries of SOEs. The equitisation of the Việt Nam Rubber Group (VRG), which is scheduled for January 2017, could be the first opportunity for employees of VRG’s subsidiaries to buy shares of the State-owned rubber producer. The draft decree will enable the employees in SOEs’ subsidiaries to buy a maximum 100 shares for every working year of their career in the State-owned industry at the price equal to 60 per cent of the share’s face value of VNĐ10,000 (US$0.44). According to existing regulations, only employees of the parent SOEs can buy preferential shares when the companies are equitised. Under Decree 59/2011/NĐ-CP, each employee, who appears on the pay-roll of the SOE when the company announces its total value for equitisation, can buy 100 shares for every working year of his career in the company. The buying price is equal to 60 per cent of the lowest selling price at the initial public offering (IPO) if the company decides to organise an IPO first, or equal to 60 per cent of the lowest selling price to strategic investors if the company decides to sell parts of the company to strategic investors first. Under Decree 116/2015/NĐ-CP, the SOE can sell shares to its employees at the price equal to 60 per cent of the starting price in the equitisation plan before the equitisation takes place. Therefore, the State basically has given the SOE’s employees a 40-per-cent discount of the share selling price, and the employees need to wait until the equitisation is disclosed to know how much they have to pay for their ownership.